This necessitates the need for accurate, auditable, accountability of the condensate business process. Further, once condensate data is entered by Field Operations, the balance of the condensate volume tracking process is often highly disjointed with the same data being manually entered into multiple spreadsheets and database applications (measurement, accounting, marketing, EH&S, etc..). This reduces organizational efficiency, increases the risk of errors, and increases the risk of losses across the system. 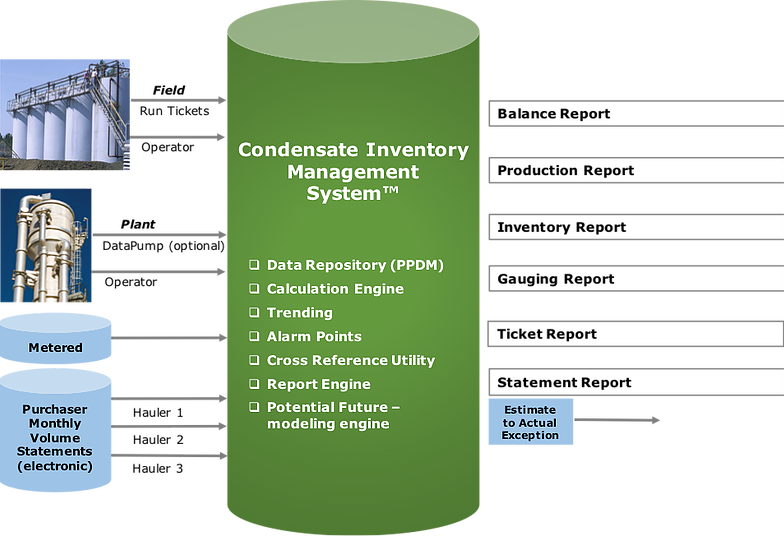 eSimulation developed the cloud-based Condensate Inventory Management system to automate and manage the entire condensate business process. The solution provides a central decision platform that all groups can use to manage the condensate business – EHS, Field Operations, Plant Operations, Engineering, Marketing, Accounting, Measurement, and Analytics. The Condensate Inventory Management Solution tracks condensate volumes, transactions, transfers, component analysis, RVPs, and water hauling activities to determine the best way to optimize the condensate gathering / distribution process. The application allows management teams to monitor condensate tank volumes (run tickets, strapping, etc…), compare the expected condensate sales amount to sales statements provided by third party trucking companies, and to track condensate revenues. It also provides all the reports necessary for all groups to manage the business in a coordinated fashion. Sends data to the Oil and Gas Volume Tracker for component balances. The loss factors from the Oil and Gas Volume Tracker and Condensate Inventory Management system are uploaded to the eSimEvaluatorTM business model where the losses are quantified in dollars based on the producer contract at each inlet point and current commodity pricing.